This is a shrub native to tropical regions of Mexico and Cuba and also to the Gulf States in the U.S. This includes Texas where it can be found in the Rio Grande Plains and the Southern portion of the Edward’s Plateau. Malvaviscus arboreus var. drummondii has flowers that are similar to those of Hibiscus however the petals only partially unfurl, producing a narrow funnel shaped flower, thus explaining the common name of Turk’s Cap. This plant reaches 3-4′ but can grow as tall as 10 feet with an equal spread. It has long pendulous bright red flowers that are 2 to 3 inches long. 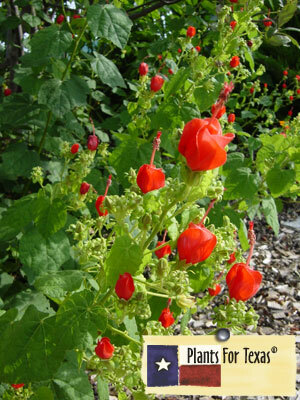 Turk’s Cap requires full sun or partial shade, however if grown in partial shade you may sacrifice some flowers because of the reduced light. The flowers do a fantastic job of attracting bees and humingbirds into the garden. In early spring prune back half of the previous season’s growth to ensure good flowering in late summer months. Malvaviscus arboreus var. drummondii is part of our Plants For Texas® Program, meaning it was Texas Grown, Tested in Texas to perform outstanding for Texas Gardens.